Newby Hall, near Ripon in North Yorkshire, has been described as ‘one of the most elegant houses in the country’ and that is a suitably fitting description. Attributed to Sir Christopher Wren and enlarged and improved by the prolific 18th century architect John Carr, the spectacular ceilings and plasterwork are by Robert Adam. The contents of the house, collected by the present owner’s indirect ancestor William Weddell, show superb taste and craftsmanship – Chippendale furniture, rare Gobelin tapestries, good pictures and fine classical sculpture collected on his Grand Tour. 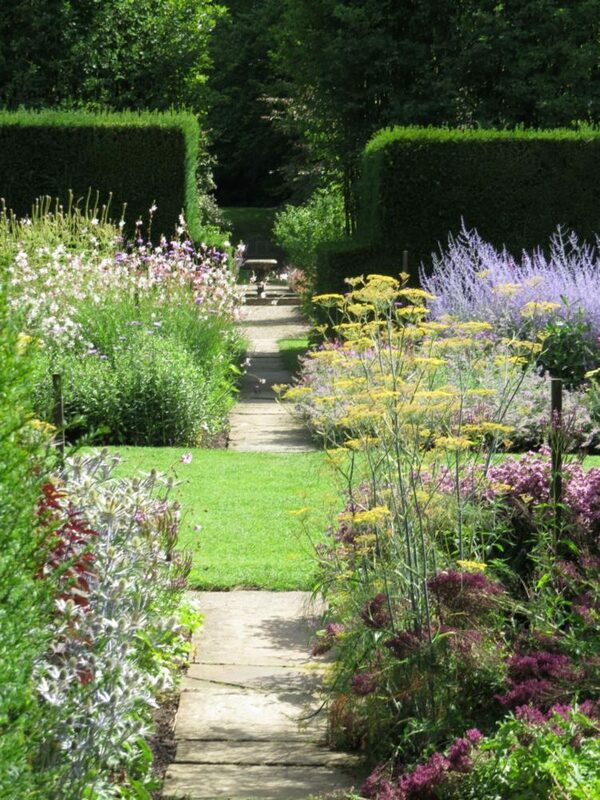 The house, although not large, is a jewel set in a fine English Landscape Park. The present owner’s grandfather, Major Edward Compton, inherited the house in 1921 and described it as ‘a lovely picture without a frame’. The first step was to sweep away the fussy Victorian parterres close to the house and plant a shelter belt to protect from the biting easterly winds. 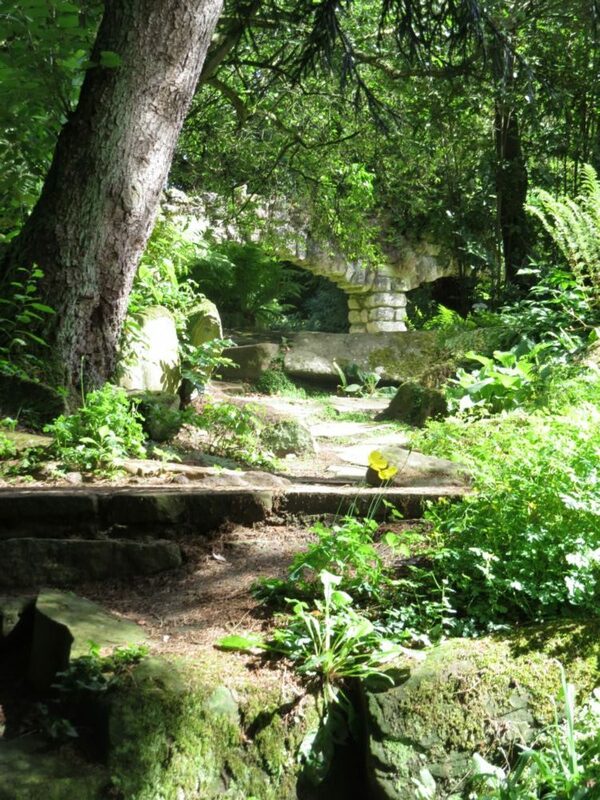 (Only the excellent late Victorian Rock Garden has been retained and replanted.) 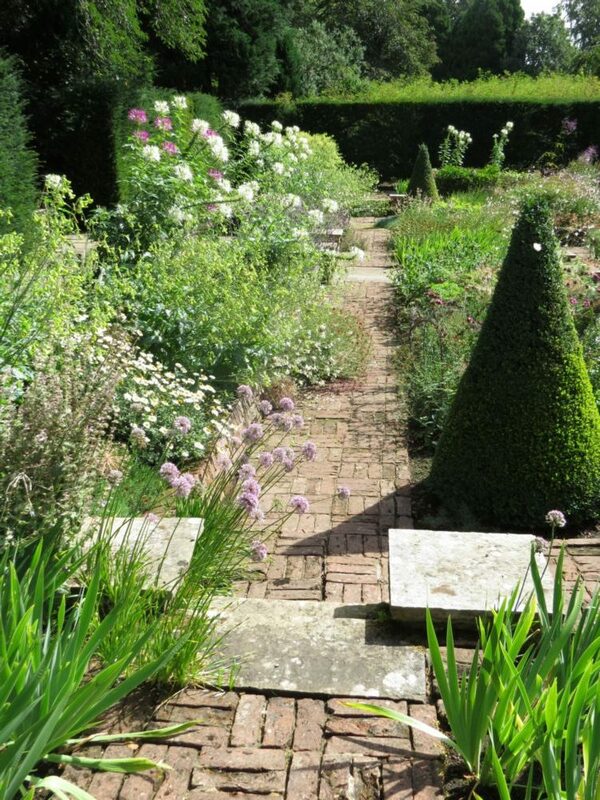 Greatly influenced by Lawrence Johnston’s garden at Hidcote, he resolved to build a garden with a strong central axis leading down to the River Ure and with compartmented gardens off to each side. The garden’s most iconic feature is this strong axis, with long herbaceous borders backed by high yew hedges and separated by a broad swathe of lawn that sweeps down from the south face of the house to the river. The two brick gazebos by the landing stage act as visual stops to the borders but the green swathe continues as parkland rising on the hill beyond the river, a very satisfying aesthetic solution. 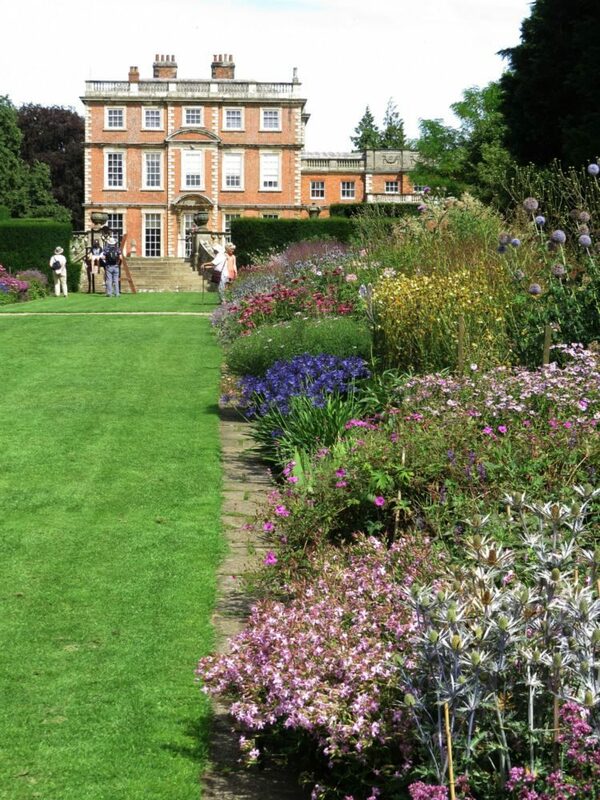 Herbaceous borders by nature are transitory, and the stronger plants tend to spread and smother the weaker ones and so replanting, section by section, is an on-going project which at Newby is carried out to a ten-year time frame. Shrubs give bulk to the borders, and planting is in limited colour palettes that vary along the length of the border with the larger plants placed at the back. 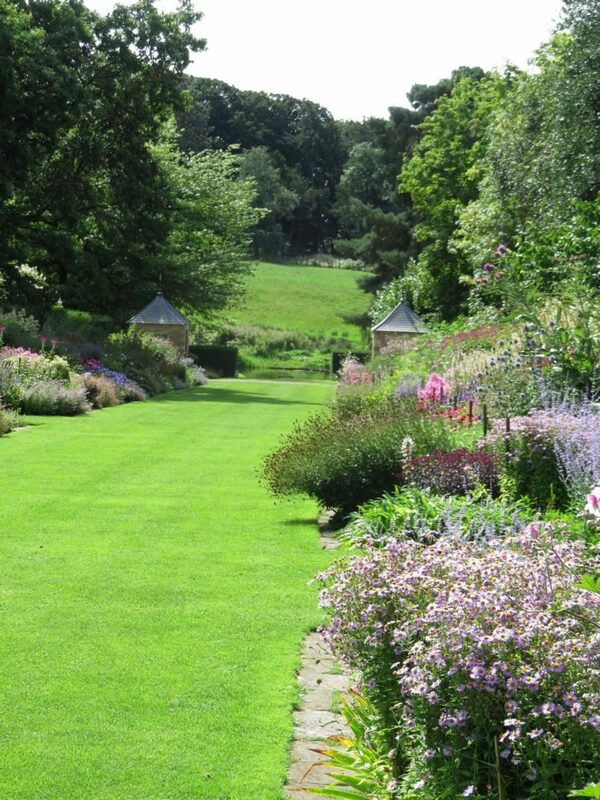 This is a garden of traditional 20th century formality softened by effusive perennial planting, with no attempt to add modern informality by the introduction of fashionable grasses. 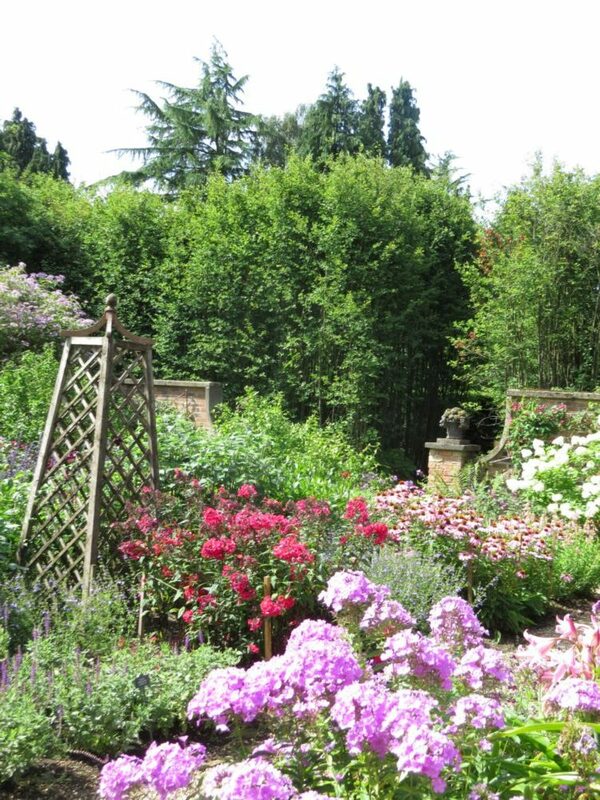 Newby is a large plantsman’s garden, and unlike many smaller gardens has not attempted to add all year-round interest to every part of the garden. Not known for its bulbs, the spring season is particularly noted for the rhododendrons and magnolias flowering in the Beacon Garden, and the camellias and primulas of the Water Garden. These are followed by the golden pendulous racemes of Laburnum ‘Vossi’ over the Curving Pergola, the impressive National Collection of Cornus, and the collection of roses. The Old-Fashioned Rose Garden provides a spectacular display of moss roses, gallicas, and hybrid bourbons in early summer, flowering at the same time as the Rose Pergola festooned with Victorian climbing roses. There is also ‘The War of the Roses’, a walk with red Rosa gallica officinalis to one side and white Rosa rugosa alba to the other separated, by the beautiful striped Rosa gallica ‘Versicolor’. However, in view of the importance of roses to the garden an argument could be made for the introduction of modern repeat-flowering shrub roses, to delight the large numbers of visitors who come during the summer months. Similarly, the White Garden was not at its best at the time of my August visit particularly when compared to the long flowering season of the famous White Garden at Sissinghurst, but this disappointment was offset by the charm of the late summer flowering perennials in Sylvia’s Garden and the Autumn Garden with its large superb collection of salvias. Newby is a gardener’s garden with a wide collection of unusual trees, shrubs and particularly of perennials, and is that rare thing – a superb garden that has found a successful formula to attract and interest visitors and their children without resorting to overt commercialisation and without the marketing strength of the National Trust or the prestige of the great palaces.